. يعمل شقق أوكس كازينو تاورز على ضمان إقامة مريحة لضيوفه من خلال خدماته الممتازة وحسن ضيافته. يمكن لضيوف الفندق الاستمتاع بالميزات التالية على أرض الفندق: خدمة التنظيف يوميًا, كازينو, مكتب الاستقبال على مدار الساعة, تسجيل وصول/خروج سريع, تخزين الأمتعة . يمكن للنزلاء الاختيار من ضمن مجموعة من الغرف المصممة بعناية لتعكس جواً من الراحة، والتي يتجاوز عددها 113. يقدم الفندق مجموعة واسعة من وسائل الراحة المتنوعة، كمثل: مركز للياقة البدنية, ساونا, حمام سباحة خارجي, سبا. إن شقق أوكس كازينو تاورز هو خيار ذكي بالنسبة للمسافرين إلى بريسبان، بما يوفره من إقامة هادئة ومرحة. Location is real good n convenience. Casino jus across e street, 5 mins walk to Queen street mall. Supermarket n eatery r jus nearby. Big n clean apartment. Receptionist are all very friendly n helpful.Dail housekeeping is available. kitchen is looking outdated with some melamine around cupboard doors are peeling and some hinges are loose. Other than that the apartment overall is great, location is perfect right in the heart oh the CBD and the views...., Wow!!!!! I can say location is the best if you prefer to stay in a city center or around south bank. It is located right in front of casino&its hotel The view is great especially if your room is heading to the river. We stayed here one night on our way back from the coast. The apartment was a stones throw from the casino (mum and dad were happy), Queen street Mall (Miss 15 was happy) and pancake manor (Master 6 was happy). Fantastic location, clean, comfortable beds. Would recommend. The whole apartment is extremely spacious and we can view the river and the Ferris wheel! With open kitchen and microwave, we can enjoy light meal at the apartment! Staff are friendly and location is convenient! Will surely stay here again if we come again! Not bad for a serviced apartment, lifts are really slow, pool is pretty good for the size overlooking the river. Parking cost about $30 per day which was disappointing and you you cant stop out the front so need to drag in bags from carpark. Apartment was clean and comfortable, spacious and well laid out, right in the middle of the CBD. Stayed here overnight for our anniversary. Fantastic location within metres of quality food and entertainment. We had a 1 bedroom apartment which was perfect for the evening and had stunning views over Brisbane. Even though it was a 'city view', we had a river view from the terrace, making it the best of both worlds. The apartment was well furnished and the terrace was large and inviting. The pool and spa are fantastic as the views from there are also spectacular. Would definitely stay here again! I stayed here for five nights and paid the price of a 3-4 star hotel. Normally in hotels of 3 stars or above they change your linen at least every second day. After three nights I asked them to change my linen and they refused saying that I would require management approval to have that happen! I rang the front desk and spoke to the duty manager and it still didn't happen. Rubbish was not removed from the room and the whole place is really run down...do not stay here! For the price you could get a better hotel/apartment elsewhere. We requested a large balcony with river view and were not disappointed- the view was great and the size of the rooms & balcony were very good! The bed was comfortable and we had no issues with the in-room facilities. There were only 2 lifts that serviced the majority of the 39 floors, so there were long waits for a lift at times. Also, the parking arrangement and access was a bit confusing, but staff were helpful enough to get around this. I booked to stay here as my partner and I had a few weeks between moving out of our old place and into our new one. The room was very roomy, it didn't feel like we were staying in a hotel room which most places these days lack. Close to everything in the city, we booked for one night and ended up staying for a week. The accomodation was great value for money, would have been perfect if we could have paid extra to upgrade Foxtel, the remote control for it was also a bit grubby and only one mug for hot drinks, but if that's all I can complain about it can't be bad! Location ,comfy bed, reception staff especially Jason. We had a lovely 1 night stay at the end of our 2 week holiday around Queensland. This also coincided with our wedding anniversary. We found the rooms to be of a high standard and the bed extremely comfortable. Having a heated pool and spa with an outstanding view, was a great bonus! 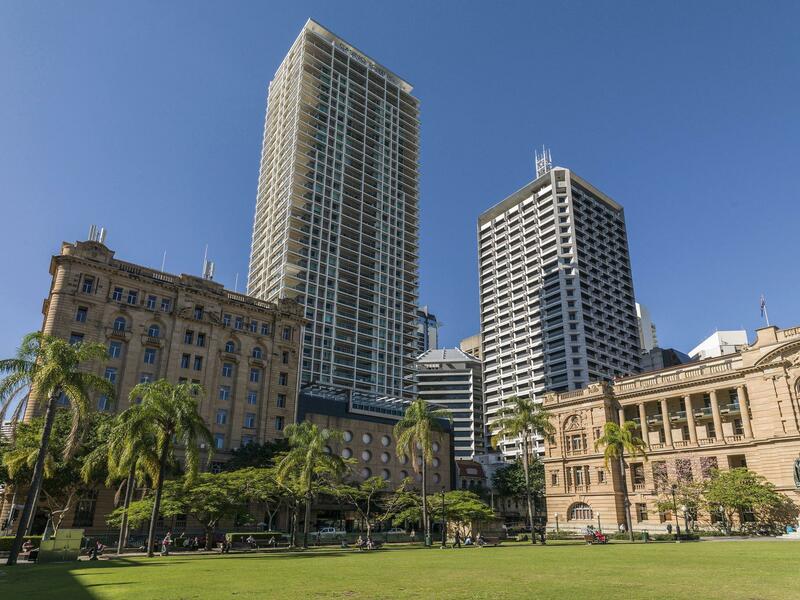 The location was fantastic especially to the rear entrance of Queen St mall, and walking distance to South Bank. The reception staff were excellent especially Jason, who handled our arrival and departure, in a friendly professional manner. Thank You. This location is excellent for access to River and city activities. However, we had a few minor issues: TV didn't work for two days, Internet was expensive, and we saw cockroaches in the kitchen at nighttime.other than those issues which were not addressed, the property is nice. We had a good stay. Location and apartment size was good. The full cleaning service could have been more regular instead of weekly. Housekeepers should familiarize themselves with no. of people staying in room so that I do not need to call to ask for extra set of towels esp when I had paid for the extra bed. Other than the above, I have always enjoyed staying at Oaks apt whenever I visit Australia. It was a great stay with high floor view. Carpark was convenient for us. The kitchen was comprehensive well equipped for our cooking. The room was spacious & comfortable. Will recommend friends & relatives to patronize. Certainly will sign for next trip stay if offered attractive discount rate to repeat customer. Apartments are centrally located in perfect position for walking tracks, shopping and restaurants. Room was older than I expected from photos online, however apartment had everything needed, apart from a sharp knife in the kitchen!